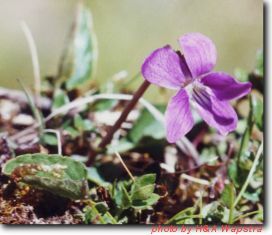 Resembles small cultivated violets. Has a short spur sticking out behind the flower. Perennial herb with rosette, leaves much longer than wide, erect rootstock. Common in damp places, mainly on Central Plateau. Will seed itself readily. Can also form seed without showing petals. Suitable below powerlines.